Lakshmi Devi is on the Board of Directors for the Winter Conference on Brain Research, 2016 Breckenridge, Colorado. Amanda Fakira received a Travel Fellowship to attend the 2017 Winter Conference on Brain Research, Montana. Lakshmi Devi gave a Keynote Lecture, 50th Meeting of the Brazilian Society of Pharmacology and Experimental Therapeutics, Iguazú Falls, Paraná, Brazil, October 2016. Salvador Sierra gave a talk in a webinar organized by The Scientist about protein-protein interactions and proximity ligation assay in neurodegenerative diseases, October 2016. To access the webinar click on the image. Erin Bobeck received a Young Scientist Award from the Neuropharmacology division of American Society of Pharmacology and Experimental Therapeutics. Lakshmi Devi was awarded the Faculty Council Award for Academic Excellence (Senior Research Faculty). This prestigious award given at the Icahn School of Medicine at Mount Sinai, recognizes achievements in all areas of academic pursuits: research, scholarship, teaching, clinical skills, leadership, and mentoring. Erin Bobeck and Ivone Gomes were invited to give oral presentations at the 2014 International Narcotics Research Conference and received travel awards to attend the conference in Montreal, Canada, July 2014. 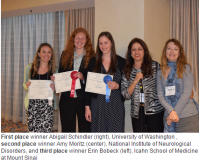 Erin Bobeck received a Young Scientist Award from the Neuropharmacology division of American Society of Pharmacology and Experimental Therapeutics and received a travel award to attend the Experimental Biology Conference, San Diego, CA, April 2014. Wakako Fujita was invited to participate in the symposium titled, ‘Advances in exploring receptor-receptor interactions in opioid receptor function’ at the 2013 International Narcotics Research Conference and received a travel award to attend the conference in Queensland, Australia, July 2013. Lakshmi Devi was a presenter at the 2013 Annual GoldLab Symposium. Her talk was titled, Big Science on a Small Budget: Neuropeptide Receptors and Drug Discovery. Mount Sinai Researchers Identify New Receptor in Brain Important for Controlling Obesity. Lab of Lakshmi A. Devi, PhD, uses mouse model to locate the receptor.